Game plans are important for any team. Some teams base their game plans on their teams’ strengths. What can your team do well with the players you have? Some teams perform well on power plays, while other teams have great defense. Teams can also develop their game plan based on the opposing team. What can you do to exploit your opponents’ weaknesses? How will you adjust your game based on your opponents’ strategy? These are important questions to develop a winning game plan. However, game plans don’t guarantee success. Teams can fall short for two reasons: throwing out their game plan and not being fully committed. Some teams abandon their game plan. They might get nervous, caught up in the hoopla of the game or feel frustrated with their performance. Without a game plan, it’s difficult to carry the team to victory on talent alone. Other teams have game plans, but aren’t fully committed to them. Without full commitment from the players, your team becomes indecisive, tentative and over thinks their performance. Your team essentially looses trust in their game. Losses can be especially tough on a team’s trust in their game plan. The San Jose Sharks haven’t lost trust in their game plan despite their 2-1 loss to the Chicago Blackhawks in Game 1 of the Western Conference finals. “It’s not going to be extra pressure to win the game, and it’s not going to be us running around in chaos. We’re going to stick to the same plan we always have and go out and execute it,” said Devin Setoguchi. Your (or your teams) performance doesn’t always go according to plan. There may be times when you’re executing plays well, for example. This may call for a change in your strategy or game plan. Adjust your strategy to compensate for what’s not working for you. You might consider changing up your plays to take advantage of the opponents’ weaknesses. 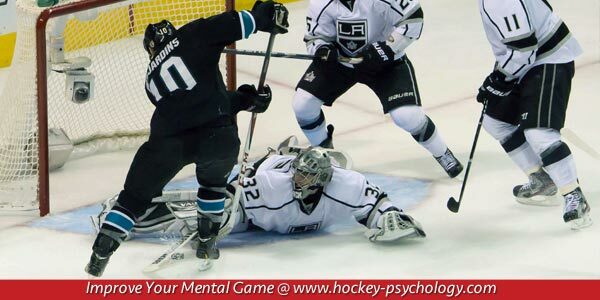 Use the part of your game that is working, such as skating well during the power plays. The key is that even if you chose to change your game plan, you’ll want to stick to it. The bottom line: Full commitment and confidence in your game plan is crucial to your success. Once you decide to change your strategy, stick to it. Full commitment to a poor strategy is better than no commitment to a sound strategy.